This entry was posted in contented. Bookmark the permalink. Oh that looks wonderful!! Who needs to get any work done! I'd be taking tea breaks every hour. That might be too comfortable.A timer with an ejector switch might be in order. cheers! A break well deserved! actually the floor is way to clean….get back to work H! LOVE that! I can almost see the gears turning in your head…. You are basking in the glow of utter civility! Nice job. It's relaxing just to look at that scene. Have fun in your new studio! I like the little figures drying on the top of the stove – a great place to dry small things quickly! Did you know you can also smoke-fire pots in a stove that size? 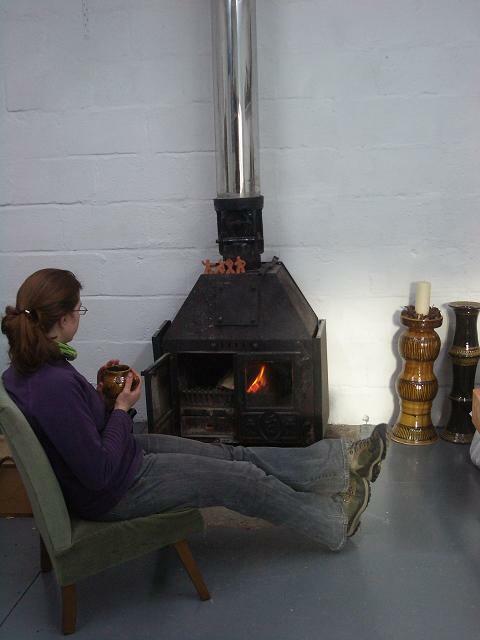 serious fault….the stove needs a flat top for the coffee pot!otherwise, bliss! !